The two scientists, Scott Sheppard and Chad Trujillo, who first recognised the clustering of objects thought to reveal the presence of 'Planet Nine' (1), have announced the discovery of three new objects. All three are highly distant objects (2). Two of them are extended scattered disk objects beyond the traditional Kuiper Belt, and fit reasonably well into the afore-mentioned cluster. The third, perhaps even more amazingly, is an object whose elongated orbit reaches way out into the distant Oort Cloud of comets, but which also never comes closer than the planet Neptune. So, this is the first outer Oort cloud object with a perihelion beyond Neptune, designated 2014 FE72. "The new objects they have submitted to the Minor Planet Center for designation include 2014 SR349, which adds to the class of the rare extreme trans-Neptunian objects. 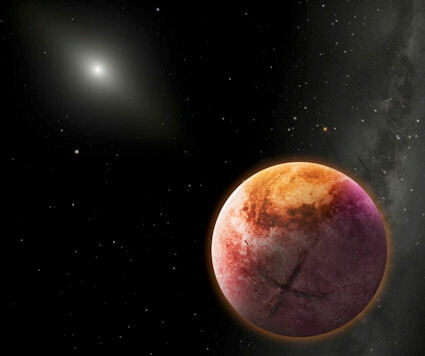 It exhibits similar orbital characteristics to the previously known extreme bodies whose positions and movements led Sheppard and Trujillo to initially propose the influence of Planet X. "Another new extreme object they found, 2013 FT28, has some characteristics similar to the other extreme objects but also some differences. The orbit of an object is defined by six parameters. The clustering of several of these parameters is the main argument for a ninth planet to exist in the outer solar system. 2013 FT28 shows similar clustering in some of these parameters (its semi-major axis, eccentricity, inclination, and argument of perihelion angle, for angle enthusiasts out there) but one of these parameters, an angle called the longitude of perihelion, is different from that of the other extreme objects, which makes that particular clustering trend less strong. In their paper, the astronomers argue that the orbital properties of these objects provide further evidence for the existence of an unknown massive planet on an eccentric orbit. The more objects fitting this pattern, the more unlikely it is that this is some kind of statistical 'blip' which can be explained away as coincidence. They maintain that the configuration of this growing cluster of objects is 'anti-aligned' to the perturbing orbit of the Planet X objects shaping their collective anomalous trajectories. The parameters of this as-yet undiscovered Planet X object (or Planet Nine, as named by Mike Brown and Konstantin Batygin in their influential paper published in January 2016 (5)) are becoming steadily more constrained with each new piece of evidence that comes to light. The discovery of 2014 FE72 is particularly remarkable. It currently lies about 61 AU away, and achieved perihelion back in 1965 when it was just 36AU away - still quite a long way beyond Neptune, in the Kuiper Belt. But its elongated orbit takes it out to about 3,800AU, within the inner Oort Cloud of comets, in a circuit that lasts a remarkable 86,000 years (6). So, 2014 FE72 effectively transits between the inner Oort Cloud and the Kuiper Belt without ever entering the planetary zone of the solar system. This places it into a quite different category of object than standard long period comets, and extends the range of the 'Sednoids' considerably. So then why include it in an academic paper whose title points towards Planet X? The implication seems to be that the undiscovered planet has drawn this inner Oort Cloud object down into the solar system. This, potentially, puts this object into a similar category as Niku and Drac, whose retrograde motions may imply a similar origin (7). I think this emerging pattern may also indicate that Planet X (Planet Nine in Dr Brown's parlance) is perturbing objects from both ends of its orbit: some up from the Kuiper Belt, some down from the inner Oort Cloud. This, in turn, implies that its reach into the outer solar system is considerably longer than that envisaged by Brown and Batygin: either in terms of a greater orbital length, or greater mass - or both. There's a second issue which I'd like to address, which is made obvious by the diagram published alongside the press release. 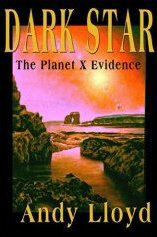 One of the new objects, 2013 FT28, appears to be aligned with Planet X, not anti-aligned. The authors allow that this object does not fit into the cluster as well as the other Sednoids, largely due to its quite different longitude of perihelion. They also argue for the anti-alignment in their abstract (2), which places Planet X in the opposite side of the sky from the bulk of cluster. Yet, it seems curious that 2013 FT28 seems to buck this trend. 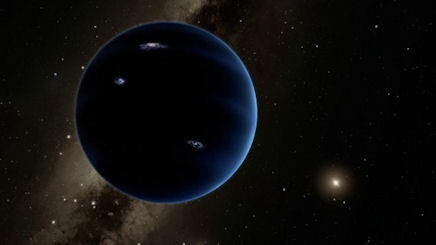 Journalist Mark Kaufman interviewed Scott Sheppard in the wake of this announcement, allowing us to gain some insight into the astronomer's opinions about Planet Nine (which his team is actively hunting). Sheppard estimates the probability that Planet Nine exists at about 80%. He likens the current search to the run-up to the discoveries of other outer solar system planets - Uranus and Neptune - and the dwarf planet Pluto (8). In terms of the origin of this proposed Planet X body, Sheppard's working hypothesis is that it's a rogue intruder from the planetary system of another star in the Sun's initial birth cluster. Both of these sets of workers find the chances of such a successful capture occurring to be 2% or less (much less, depending upon the constraints applied to Planet Nine orbital characteristics). This seems a pretty bleak possibility, until one considers the considerably remoter probabilities attached to competing theories (i.e. how a sizeable planet could have formed out there way beyond Neptune, and the preliminary protoplanetary disk). So, the capture of an eccentric rogue planet originating from outside the solar system. My goodness, where have we heard that before? New computer simulations which include Planet X in the solar system, have shown that its presence should have a profound effect upon the fabric of the outer planetary system upon the Sun's eventual death (1). This may seem rather theoretical, but modelling the end of the solar system in this way may give clues as to why rocky debris disks have been spotted around some white dwarfs (the eventual fate of our Sun), as well as why heavy elements appear in the atmospheres of up to 50% of recently formed white dwarfs (2). "Using a unique code that can simulate the death of planetary systems, Dr Veras [of the University of Warwick] has mapped numerous different positions where a ‘Planet Nine’ could change the fate of the solar system. The further away and the more massive the planet is, the higher the chance that the solar system will experience a violent future. This discovery could shed light on planetary architectures in different solar systems. Almost half of existing white dwarfs contain rock, a potential signature of the debris generated from a similarly calamitous fate in other systems with distant “Planet Nines” of their own. As stars die, they expand into red giants, engulfing the planets in their inner systems, and driving their outer planets out to more distant orbital positions. Then the red giants collapse into white dwarfs, leaving behind an empty graveyard in their wake. Or so the thinking goes. However, this mechanism fails to account for the observations of warm, dusty disks around many such systems (4, 5). The extant dust shouldn't be there at all. Instead, it should have spiralled down into the red giant, getting swallowed up in the process. Yet, planetary systems seem to be able to survive the death of their stars - at least for a while: There is real-time evidence of planets in white dwarf systems actively disintegrating (2), indicating on-going processes long after the white dwarf has been formed (6). 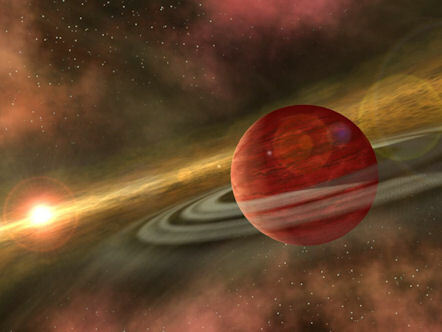 The presence of a distant binary companion - like an old brown dwarf - or a substantial Planet X-type body, may explain why such anomalous disks and extant planets come to be found in so many white dwarf systems. By their very nature, wide binaries and Planet X-type objects are difficult to discern, both directly and through their indirect gravitational effects. 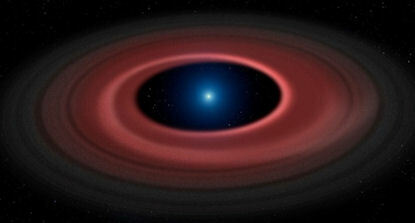 If they provide an explanation for the relative abundance of anomalous warm dust disks around white dwarfs, one might be forgiven for speculating as to whether such substantial extreme outer planets are more populous than previously thought. It was recognised early on that if they existed at all, they would be very difficult to spot - and so it proved. In recent years, the ability to detect these objects has improved considerably, including more effective infra-red sky surveys. As they have become more common, the frontier of sub-stellar bodies has dropped in mass into the ultra-cool stellar bodies known as sub-brown dwarfs - many of which would equally properly be designated as rogue gas giant planets. These objects tend to have masses below 13 times that of Jupiter (13Mj) (2). These objects have always interested me greatly, and very early on in my own research efforts I was advocating the potential importance of sub-brown dwarfs in the hunt for additional planets orbiting our own Sun at great distances (3). I used the term 'Dark Star' to describe these ultra-cool objects; a term suggested by a friend of mine. Some can be found orbiting stars (usually beyond 50AU) while others are free-floating entities in their own right. These kinds of objects began to crop up with increasing frequency. Many of these early detections were at the earliest stage of their development, and so still capable of emiting visible and infra-red light (e.g. (4)), but these young sub-brown dwarfs started to give astronomers a clearer idea of the general population numbers of their older brethren lying in the galactic darkness. The WISE infra-red sky survey was partly designed to seek out nearby brown dwarfs and sub-brown dwarfs. The result of this survey was pretty disappointing in this regard, as it didn't seem to find the kinds of populations of BDs expected (5). That was despite observing some very cool sub-brown dwarfs indeed (6). "Knowing the abundance and distribution of brown dwarfs provides key information on the distribution of mass in the universe, and on the mechanism of brown dwarf formation, for example, whether they form in isolation or instead are ejected from larger planetary systems. 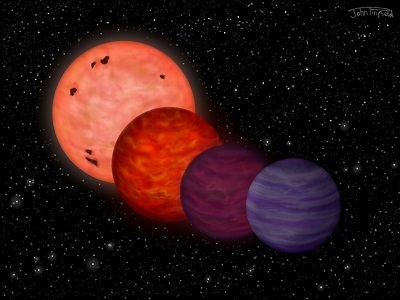 To that end, the team, led by Jasmin Robert of Université de Montréal, believed that although hundreds of ultracool brown dwarfs have already been discovered, the techniques used to identify them were overlooking those with more-unusual compositions, which would not show up in the color-based surveys generally used. "So they surveyed 28 percent of the sky and discovered 165 ultracool brown dwarfs, about a third of which have unusual compositions or other peculiarities. When talking about brown dwarfs, ultracool means temperatures under about 3,500 Fahrenheit or 2,200 kelvin. “The search for ultracool brown dwarfs in the neighborhood of our own Solar System is far from over,” said [Carnegie’s Jonathan] Gagné. “Our findings indicate that many more are hiding in existing surveys.”" (8). This provides great hope for those of us who advocate the existence of a sub-brown dwarf object in the outer solar system (including Nemesis, Tyche, and the Dark Star). Simply put, assumptions made about these objects may have been too restrictive, allowing a great many of them to have slipped through the net. Scientists working with data from WISE may have missed a solar system sub-brown dwarf, and then wrongly dismissed it as impossible. ""We are on the telescope at the end of September for six nights. We need about 20 nights on the telescope to survey the region where we think we need to look. It’s pretty close to the constellation Orion...We’re waiting for another couple of weeks before it’s up high enough in the sky that we can start observing it and then we’re going to start systematically sweeping that area until we find it. Let's hope they're on the money. They have quite a lot to say about some of the correspondence that comes their way from members of what might loosely be termed 'the Planet X community'. Their major objection to any allusions to the fabled planet Nibiru stem from Planet Nine's projected orbit lying well beyond Neptune's. Zecharia Sitchin, by contrast, maintained that Nibiru must return periodically to the site of the 'Celestial Battle', at the asteroid Belt during perihelion (4). For some years, my own research has led me to realise that a sizeable Planet X body must lie well beyond the outer planets of the solar system. Indeed, a diagram I put into my 2005 book shows the 'Dark Star' as moving around the Kuiper Belt (itself a sort of asteroid belt located beyond Neptune) at perihelion (5), rather than moving in to the inner solar system (even by Dr Brown's definition). 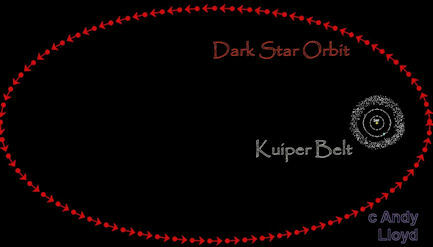 The same diagram shows the Dark Star moving out to the inner Oort Cloud at aphelion. Of course, I am not Zecharia Sitchin, and my attempts to revise some of his ideas in the face of physics and planetary science have not always been met with glee by his advocates. So, Dr Brown is right to say that his version of Planet X does not correlate with Nibiru - at least in terms of its perihelion distance (there are other markers which are uncannily similar (6), which he tends to avoid mentioning in his self-evident desire to debunk Nibiru). But Planet Nine does correlate very well with the orbital attributes that I claimed for the 'Dark Star'. Where my own version of this sizeable Planet X object differs from the proposed Planet Nine is mass; Planet Nine is Neptune-sized, while I envisioned a sub-brown dwarf object of several Jupiter masses. Perhaps this object's position is more distant than Brown and Batygin think, with a greater mass than the 10+ Earth masses they attribute to it (which, incidentally, is also a figure originally proposed by Sitchin). If my sub-brown dwarf idea is to work, then there has to be a good reason why such a sizeable object has evaded detection, and I've addressed these recently in various blogs and a scientific paper (7) (which was, predictably, rejected by the astrophysics archive ArXiv after six months of frenetic non-deliberation). I seem to have got the orbit closer to the mark, but perhaps overshot with the mass. Maybe it is still possible to have a habitable moon orbiting a very sizeable Planet Nine, but my general thesis calls for a larger gas giant. Perhaps that allusion to a sub-brown dwarf was unnecessary, as liquid water seems to be able to exist in places previously unconsidered, like Mars and Saturn's moon Enceladus. Anyway, coming back to the hunt for Planet Nine, I note that Dr Mike Brown is scheduled to provide a press briefing at the 48th annual meeting of the Division for Planetary Sciences (DPS) of the American Astronomical Society (AAS) in Pasadena next month. Dr Brown's briefing, which may take one of a number of formats - dependent, I suppose, on how big the news from Subaru turns out to be - is scheduled for Wednesday 19th October (8). Stay tuned! Excitingly, these vents offer an opportunity to potentially gain access into the deep sub-surface ocean, far below the billiard ball-like global ice cap. First, the positions of these vents would need to be determined by more accurate observations using, say, the infrared vision of NASA’s future James Webb Space Telescope, scheduled to launch in 2018. 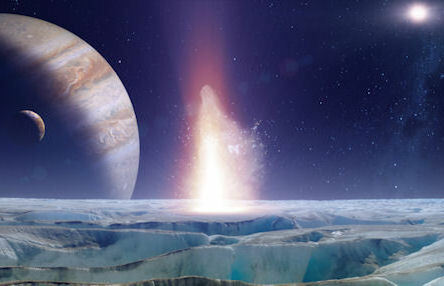 Then, flybys by future space probes, while the moon is at it furthest from Jupiter, could enable the contents of these plumes of water to be analyses in more detail, to give an insight into the composition of the ocean within. Perhaps, one day, these same conduits to the sub-surface oceans might provide an accessible point for drilling down through the ice. After all, where there's water and warmth generated by the tidal forces acting upon Europa by Jupiter's immense gravitational field, these could be life. All of this should act as a reminder of the potential for habitable environments on moons orbiting substantial planets elsewhere. I alluded to Europa when I first wrote about the Dark Star, arguing that a moon orbiting a sub-brown dwarf might enjoy even more promising conditions (4). Like a proper atmosphere, and aqueous surface oceans. The organic material is so complex that the ESA team is unable to provide it with a proper chemical formula or name (6). The carbon in the molecules is found to be mixed with other familiar elements often seen in carbonaceous chondrite meteorites, such as sodium, magnesium, aluminium, silicon, calcium and iron. Exceptionally, however, there is the presence of much more hydrogen in the comet’s samples than in meteorites. This natural combination of carbon and hydrogen provides us with hydrocarbons, the potential complexity of which is vast. It's uncertain as to whether such complex material formed in the interstellar medium prior to the formation of the solar system, or as a result of it. 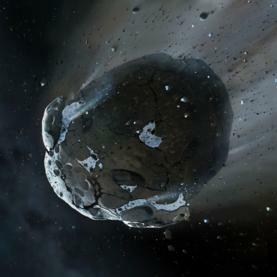 But it strengthens the arguments made for the concept of 'panspermia', specifically relating to the spread of life between planets and star systems by the movement of comets carrying complex organic chemistry - and even biochemical materials (note that amino acids have already been detected in the coma of this self-same comet (7). Upon impacting 'virgin' planets, these materials could, given the right conditions, spark the emergence of life. Lyman-alpha radiation is at the extreme end of the ultra-violet range in the electromagnetic spectrum, with a wavelength of ~120nm. This diffuse ultra-violet light source is emitted by various regions of our Milky Way galaxy, as a result of the cooling down of gaseous hydrogen atoms in vast stellar nurseries. This galactic ultra-violet radiation was detected by the Voyager spacecraft, as they escaped the more intense glow of Lyman-alpha radiation generated by the Sun (9). So, bodies in the outer solar system are benefitting from irradiation of high-energy ultra-violet radiation not only from the Sun, but also from the Milky Way galaxy, and beyond. These combined Lyman-alpha glows can drive forward chemical processes in the outer solar system, resulting in the reddening of many Kuiper Belt Objects. These processes can steadily build the complexity of organic materials on these bodies. However, a cautionary note: Ultra-violet light is much less helpful for biological processes, like photosynthesis. So, let's imagine that, in time, astronomers discover a Dark Star object in the solar system which is capable of maintaining a viable atmosphere on one of its moons. This Dark star (a sub-brown dwarf which is more massive, but also more condensed than Jupiter) would be more than capable of emitting some radiation of its own. 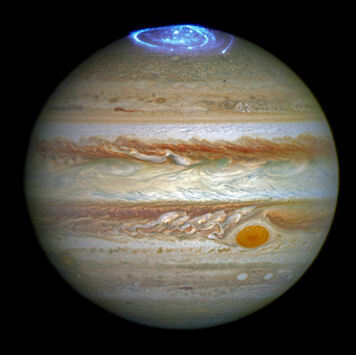 See, opposite, for example, Jupiter's remarkable ultraviolet auroras imaged earlier this year by the HST (10). The Juno spacecraft has been similarly hard at work, sending back images of the southern aurora, in infra-red, as well as the first ever pictures of Jupiter's bluish north pole cloud cover (11). In the presence of liquid surface water, one can readily imagine that the Lyman-alpha radiation falling upon a warmed moon orbiting a Dark Star - as well as supplementary radiation from the Dark Star auroras itself - could drive forward some very exciting surface chemistry. But it would be unable to provide a plant with the energy it needs through photosynthesis; a process requiring visible (especially red and blue) light. A different, entirely alien biological process would be needed to harvest the energy from this high-energy ultra-violet radiation.